I love Michelle Van Loon. She cares about abuse. She writes about entering midlife. I am grateful for the collaboration of other bright and talented writers and thinkers. To that end, I am a member of INK Creative Collective. I’m also a member of the Pelican Project, a guild of women fostering commitment to Christian faith and practice across cultural, denominational, and racial lines. She comes from a Jewish background and became a Christian. (She) served for 8 years as the U.S. Administrator for the Caspari Center for Biblical and Jewish Studies. She makes me smile, even laugh out loud and she makes me think. Like Michelle I hated gym class and my gym teacher didn’t like me. I was picked second to last in any sport that needed talent. However, one day in my senior year, I raised a protest and walked out of gym class, claiming I was being treated unfairly by the teacher. Everyone who had a note from a doctor was dismissed to the library except me, who had to sit there. I almost got suspended but I successfully argued my case with my father who took up my cause and went to the principal. He agreed and let me spend the rest of the year in the library instead of gym class! It was the best 6 months of high school. 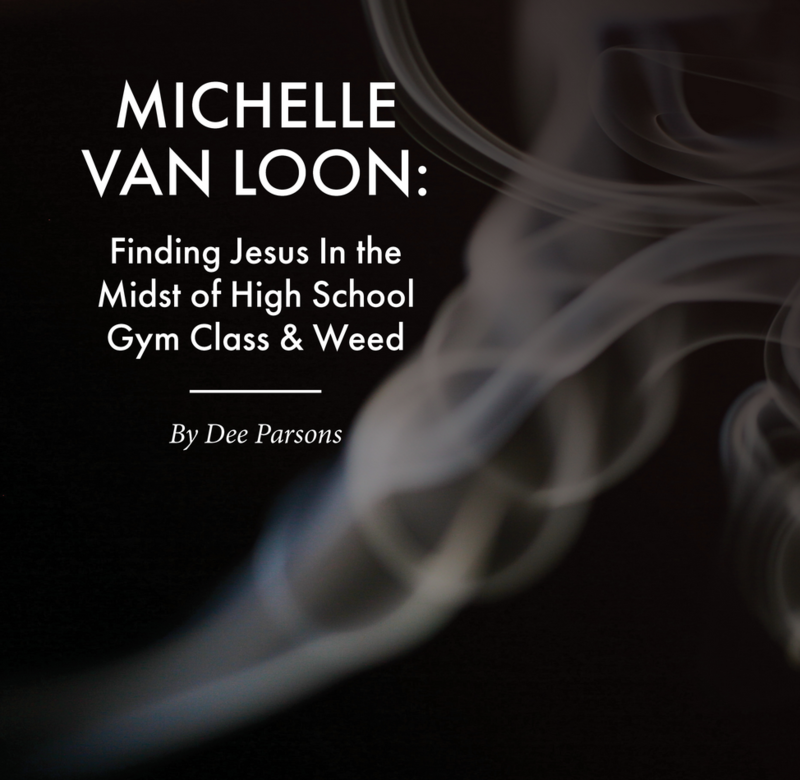 I hope you enjoy Michelle telling recounting her “come to Jesus” story as much as I did. Here’s a bit of my story. You might just see some of your own story echoed in it, too. All of my life, I’ve felt like a displaced person. It wasn’t because we moved around a lot. My family relocated once, when I was 13, to a home about 15 minutes away from where I’d spent my elementary school years. It wasn’t because there were disrupted relationships at the core of my life. There weren’t. However, home didn’t always feel like a safe place. The only other place during my childhood that might have served as a refuge might have been school, but Mr. Slovowsky’s gym class and the team games on the playground amped those homeless feelings in my soul. This is because I was a smart, bookish nerd-girl who was always the second-to-last one picked for all team sports. As an adult, I’m amazed at how many people I meet that tell me that they were the last ones picked in gym class while they were growing up. It seems like there’s many of us who’ve suffered the indignity of waiting for someone to tell us that we could be on their team. That eternal wait watching everyone except Ellen Friedman get chosen before me for every team ever assembled at Mark Twain Elementary School telegraphed me a loud, painful message: Hey Loser! You don’t belong! Mr. Slovowsky, the sadistic gym teacher of my childhood nightmares, didn’t do much to help the situation. Even his name – Slovowsky – conjures a picture of a tattooed drill sergeant making scrawny recruits do one- armed pushups to the 60’s song “Go You Chicken Fat, Go” in the pouring rain, wearing a twisted grin on his war-scarred face. It would probably be fair to mention at this point that my childhood memories might not be entirely accurate on this subject. Hindsight and life experience tell me today that Mr. Slovowsky just may have been an aging former jock who ended up with a Phys Ed teaching degree by default, not desire. One thing was certain – Mr. Slovowsky wasn’t much for lesson planning. It seemed like we spent at least 3 or 4 solid months each year in P.E. doing nothing but playing Bombardment. Bombardment, also known as Dodgeball, seemed to define my place in the world. The Mark Twain Elementary School version of Bombardment wasn’t the formal affair depicted in the scatological 2004 Ben Stiller movie Dodgeball. Instead, our low-tech, high-torture version would begin when Mr. Slovowsky would pick his 2 pets to be team captains and let them loose on the rest of us so they could choose their teams. For me, it meant sitting on the dusty gym floor and waiting…and waiting…and waiting until someone was forced to pick me. Draft accomplished, he’d send each team to one end of the gym and tell us to face the other team, each side lined up like a firing squad. Which, of course, was exactly what we were. Mr. Slovowsky then proceeded to toss a few hard red rubber playground balls into the middle of the gym and blow his whistle, signaling that the carnage could begin. He’d then settle his middle-aged girth on a rusting metal folding chair and watch dispassionately as the brave kids ran out, grabbed the balls that rolled onto their side of the gym, and then proceeded to throw the balls as hard as they could at the kids who were lined up against the opposite wall. The balls would then be fired back across the room as fast as possible. folding chair. The idea was that the weak would be quickly picked off, and the strong would survive. It seemed like about once a week, someone had to go to the nurse because they had a bloody nose or a broken wrist from all this physical education. I read not long ago that many school districts have banned this game, for obvious reasons. But back in Mr. Slovowsky’s day, we were all trapped in that gym. There was no school district trying to protect us from the terrors of Bombardment. There was just Mr. Slovowsky and his chair and his whistle keeping an eye on things. getting whacked with one of those rock-hard playground balls. So I learned to hide behind the kids who cannoned those balls as if their lives depended on it, probably because in some weird way, their lives did. A lot of kids seemed to thrive on this sort of testosterone-based competition. My aversion to Bombardment ended up making me oddly successful at it. My strategy was to try to tuck myself in a corner. If that didn’t work, I’d run klutzily from one spot along the wall to another, hiding behind the kids who were actually firing those balls at each other. When there were no more kids to hide behind, I ended up getting clobbered. Hard. Bombardment summed up for me the way the world seemed to work. The strong and wily survive; the klutzy, the homely, the Losers get clobbered and have to sit on the filthy gym floor next to Mr. Slovowsky’s rusty metal chair, watching, watching. Pretty much all of my life had the feel of a Bombardment game that went on 24/7. As I approached adolescence, I figured out, like many teens do, how to dig a bunker for myself and try to find a safe place to hide from the rest of the Bombardment-playing world. I constructed my hiding place out of reefer and promiscuity and alcohol. It didn’t take me too long to figure out that my hiding place wasn’t any safer than the outside world. I’d Bombarded myself. other corner of the globe. I believed that most Americans were Christians. nothing more than a disorganized but moderately interesting classic book of fiction. She kept telling me that her book wasn’t fiction, but Truth. Even weirder, she insisted that I needed to check out the New Testament. Why on earth would a secular Jewish girl like me touch that Gentile book? words seem to jump off of the pages. It was like the Author of those words was there, speaking them to me. Me! The klutz. The loser. The one who didn’t believe. The second-to-the-last-to-be-picked-for-Bombardment. Jewish girl like me needed to come to terms with who Jesus was and is, He found me, cowering in my bunker of substance abuse and promiscuity and despair. enough so that I could hear His heart beating. He wanted to love me, and show me what His Father was like. In that moment of eternal clarity, His arms around me, I was safe for the first time in my life. And when I looked closely at those arms, I saw them covered with angry red welts in the shape of those terrible playground balls. Jesus searches out each one of us in our hiding places. He is completely certain that you are the most beautiful pearl there is, and He was willing to sacrifice everything to have you. 4 you snooze you loose. Do I get tin this time? Thanks, Michelle, for sharing your story. Great job in making it personable and relatable. What a great reminder how God can use us when we are willing to share Christ with others, as your friend did with you. I remember hearing the story of a band in Southern California that came to Christ in the ’70s. They went out and celebrated their baptisms by getting stoned. H.U.G. probably knows who it was. FW Rez: I remember hearing the story of a band in Southern California that came to Christ in the ’70s. They went out and celebrated their baptisms by getting stoned. H.U.G. probably knows who it was. Not me. In the Seventies, I was primarily into getting through Cal Poly, D&D, and back copies of Analog. Just hazarding a guess, this sounds like something that could have happened in the Jesus People/Calvary Chapel startup. Thank you for the beautiful post about your journey to Jesus. One of my favorite poems. The rest of his poetry was pretty bad, but Thompson made up for it with The Hound of Heaven. I too was Always!picked dead last….It truly was soul destroying for me as well as being the class brain/nerd/klutz. But despite that God showed himself to me in a very clear way that made such sense and gave me such hope when I was 16! Such wonderful grace given to me. “God so loves you that He gave His only Sòn. Headless Unicorn Guy: this sounds like something that could have happened in the Jesus People/Calvary Chapel startup. Exactly, just can’t remember the band’s name. High school drove me closer to suicide than any time before or since. I have spent the past 45 years trying in vain to forget those four. See the last paragraph…. who knows. My gym teacher was similar. Bombardment almost every day – same, same. I learned how to catch the balls, which made the thrower “out” – but if he was one of the couch’s favorites, the coach would just send him back in. The game never ended, and was brutal. I did wind up in the nurse’s office once with a sprained ankle. Gym class was a nightmare, and I still remember the coach’s name – and have a hard time forgiving him. On another note: The Thompson poem has always been one of my favorites. Ahh, high school… I had to fight almost every day the same group of guys at lunch, for a year. It sucked. I only got choked out once, though, in the gym class locker room. The other time I lost a fight was a psychopath who bashed my head repeatedly into the pavement until I was bleeding from all over my skull. I was ten years old at the time. Took months to heal. I was beaten up by my step dad at home too all the time, mostly getting punched in the face and knocked around. Wrote my first suicide note at 13. On top of that I had childhood gender identity disorder! So basically, I believe in God because He’s the only reason I’m still alive and the only Father I ever had. He raised me to be strong and to love the unloved, the orphan, the homeless, the victim of abuse. He used it and many far greater struggles I’m not listing here to make me who I am, and I wouldn’t give a drop of the suffering back knowing what I’ve become through it, even as broken as I am.